Pamplona attracts over 1 million visitors each year, in July for its nine-day "San Fermin" festival, originated in the 14th century. The daily Running of the Bulls, so dear to Hemingway, is its highest profile event. 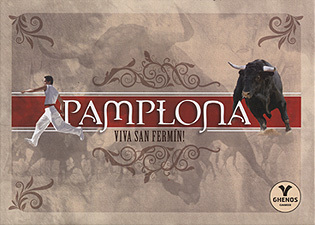 With its simple yet refined mechanics, Pamplona: Viva San Fermin! faithfully reproduces the run in all its aspects: bravery, euphoria, adrenaline, but also tactics and management. Players must run all the 4 sectors of the race, escaping from the opponents' bulls and steers, while trying to gore or trample the opponents using their own. Pamplona: Viva San Fermin! is not a common race. The winner is not necessarily the first runner to cross the finishing line, but the one who shows the most courage.